Boro will go into Monday's potentially crucial clash with Hull at the Riverside Stadium with just one win from their last five games but a conviction things are changing for the better. Alvaro Negredo made a welcome return to form in last week's 2-2 draw at Leicester and gutsy points at Arsenal and Manchester City also suggested Karanka's side are heading in the right direction. 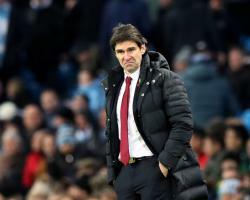 Karanka said: "Even when we are not winning games the players feel they are improving as a group as they are getting the experience of playing in the Premier League and learning from mistakes we made in the past. "We made mistakes early in the season and we lost points, but we are now adding that experience and getting more confident on the pitch and proving that we can compete against the top teams, so it is a good step going forward." Negredo's form provided a particular boost for Karanka after the player drew criticism for a lightweight start to his Boro career, and has given his manager the conviction that his attacking approach at home will pay off handsomely. Apart from last month's 2-0 win over Bournemouth, Boro have drawn blanks against Chelsea and Watford, with the flair of winger Adama Traore yet to pay off in terms of delivering the goals his side needs. He knows he has to keep going because if he continues working and fighting this way, he will score goals. We are going the right way and with the quality we have I am sure one day we will score one, two or three goals." Boro's form in December could be expected to dictate Karanka's transfer window wish-list but he insisted he has given little thought to new arrivals or departures and instead focused his energy on the busy festive season ahead. "As a coach you may think one thing and maybe players you think are happy aren't happy and want to leave, so you don't know - but I don't want to do a lot of changes." Boro defender George Friend will remain on the sidelines for at least one more week with a knee injury so Brazilian Fabio will continue to deputise against Hull, while Dani Ayala is pushing for a recall after shaking off his ankle injury.